It was a huge pleasure to work with Cold Feet Films to help tell our story. Check it out! Images like the one of the Colonial Grocery Store in Lakewood Heights were a common scene in neighborhoods in the 1950's and before. Small grocery stores served our communities well and created places that our neighborhoods could be proud of. If you talk with seniors who lived in South Atlanta their whole life, you'll hear stories of a time when 4, yes four, groceries stores served the community of South Atlanta. One only had to walk a few blocks to get the food they needed to survive. Fast forward a few decades and the stores of yesteryear are gone. Small grocery stores were replaced by supermarkets across the county. But too often these new supermarkets were located miles from neighborhoods like South Atlanta. The old stores have had their buildings occupied by other stores. Little Bear, seen here, replaced the Colonial Grocery of the 1950's. Little Bear is not a place where one chooses to go buy their groceries. The corner before Community Grounds and Carver Market! In early 2014, we embarked on a fact finding mission in regards to lurring a grocery store to South Atlanta. We found two things: 1) People spend a lot of money on food in our neighborhood, and 2) The amount spent on groceries was not enough for a large national chain to come into our neighborhood anytime soon. While South Atlanta may have had 4 grocery stores at one point, all 4 of them probably could have fit into the frozen food section of a enormous supermarket. 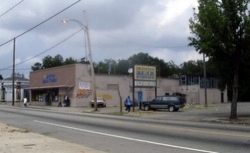 We knew by working in South Atlanta since 2001 that access to food was a huge issue. We believe that solving the issue of food access for South Atlantans is critical to returning health and vitality to our community. And so, we started our journey of opening the Carver Neighborhood Market. We hope you'll join us. It's an endeavor that we hope will bring food justice to our community and create a model for neighborhoods like ours across the country to benefit from.